I’m extremely late with this, as the deadline is rapidly approaching, but check out the Humble Bundle that includes GameMaker Studio Pro (usually $99-$149) and Android export module($299!) for only $12, or pay just $6 for GM:SP. The packages also include games made with GameMaker and the source code for those games. In case you’re wondering, yes, I bought it. Since I’m king of the late passes, I’ll try to redeem myself by letting you know that Smith Micro will be having a sale on Manga Studio EX 5/Clip Studio Paint EX in a few days. The program is more about line art and one of the programs I took a break to try and study. Quite a few artists I know on the ‘net swear by it, so keep an eye out for that sale if you don’t have it. Site updates will resume in October. For now, here’s another clip of my messing around in Anime Studio. 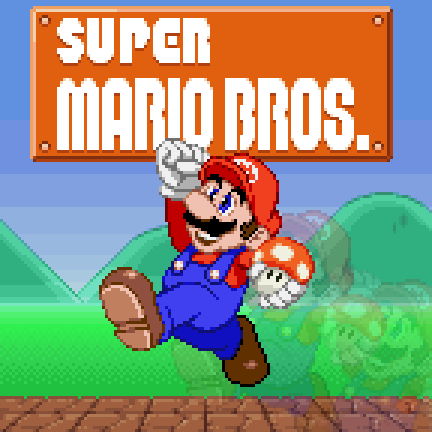 A new Mario sprite (based the original SMB cover jump, but in Yoichi Kotabe’s style) was added to the Custom Sprites gallery and the GFX Generators. If you really want to see some great SMB tributes, check out The Ankle Rocker’s fun series of photos, starring SMB action figure and games. See, that’s what toys are for: the fun happy times! Those in the mood for some art should consider buying Orioto’s 30 Years of Mario giclée art print, which celebrates the history of the entire series! I’m still on break, getting the hang of some art programs and making things for future updates. Here’s a Tumblr post with a few preview .gifs to check out the results from one program. I also started rewriting the code for the GFX Generators, something that probably won’t be 100% finished until later this year. Tags: Nintendo, Super Mario Bros.